Berry Petroleum is another company that's been relatively silent in the Haynesville Shale. A couple of months ago I posted some information, and today I've got an update of the company's own summary, showing more detail of its Darko (TX) field. 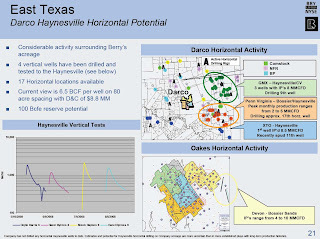 Not a lot to report, but the latest update is that after four vertical wells, Berry is planning its first horizontal well in the second half of 2009 in the Darko field. The map above shows results from neighboring competitors, most notably GMX, PennVirginia and XTO.